Storytellers and ocean lovers gathered at a symposium on ocean protection at the Royal Ontario Museum last week on December 5th to discuss all colours of the deep blue. 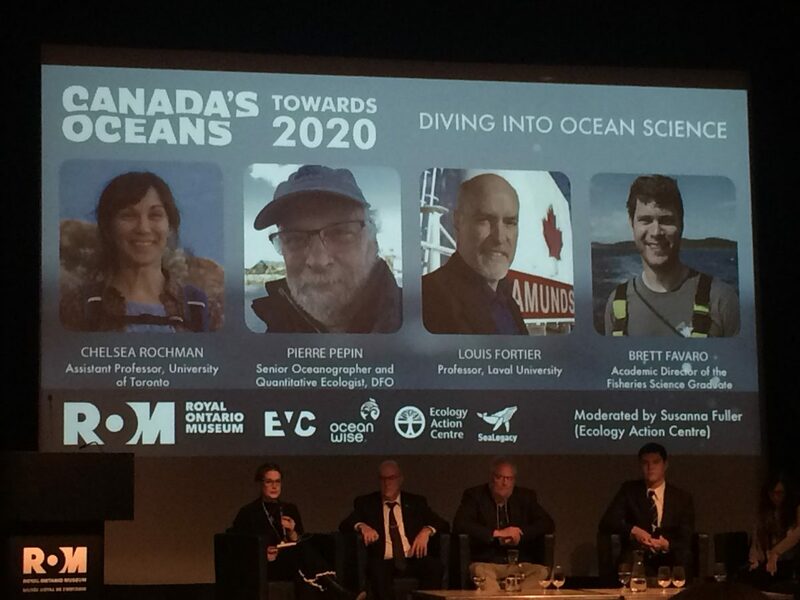 With panels composed of scientists, artists, students, policymakers and activists alike, the future of Canada’s Oceans was the topic of discussion, concern, and awe. With such a wide array of expertise, the conversations ranged from an avid surfers’ quest for the perfect storm, a professors alarming lecture on plastic pollution, to an officer and photographer’s tried efforts and victories protecting marine life with Sea Shepherd, a non-profit organization focused on marine wildlife protection and conservation. The Royal Ontario Museum's CEO Josh Basseches started the morning off with a few welcoming comments followed by introductions led by Dave Ireland, the Managing Director of of ROM Biodiversity. The first panel started with Chelsea Rochman, a professor from the University of Toronto, sharing some of the most concerning news of her findings of plastic found within both fish and oysters from our own local markets. It makes us wonder just what we are consuming when we sit down for sushi or oysters rockefeller. Following Chelsea’s presentation on plastic pollution, several other speakers on the panel touched on other subjects relating to Ocean Science such as sustainable fishing technologies, oceans management, impacts of climate change on arctic ecosystems, and much more. Half way through the day things were switched up by students from the Environmental Visual Communications program, with a presentation co-presented by Fleming College and the Royal Ontario Museum. The EVC students’ presentations captivated the audience displaying their passion for environmental issues while showcasing the power of technology. Today we spend a concerning amount of time on phones and tablets, but these devices can indeed be used for the better, as clearly demonstrated by the EVC students. Using creative videos and stunning effects, one can grab the attention of a consumer much more easily then with seemingly drab blocks of writing. They even got the audience involved by having brave volunteers share their memories and stories of their own experiences relating to Canada’s oceans. The third panel of the day focused on speakers with backgrounds in law, policy and management, enlightening us on the hard facts and efforts currently being made to enact change, such as the need to strengthen Canada’s Marine Protection Areas (MPA)*. The fourth panel looked towards the future as they discussed the various stringent action steps Canada needs to take to meet its 2020 goals, and amendments that should be made to Canada's Oceans Act. To close Ta’Kaiya Blaney, a singer and youth activist from the Tla A’min Nation in British Columbia, Canada, ends off the symposium with her stories of protesting pipelines & protecting our waters as an Indigenous youth. This article was written by Rebecca Hubert, Great Lakes Campaign volunteer at Sierra Club Ontario, and volunteer facilitator at the Schad Gallery of Biodiversity at ROM. "Canada's Oceans: Towards 2020" brought together leading ocean scientists, storytellers, Indigenous leaders and government stakeholders as they look towards 2020 in a compelling conference exploring the status of Canada’s marine conservation programs, and our role in protecting the oceans that sustain us. It was hosted in partnership between the Environmental Visuals Communications program, Sea Legacy, Ecology Action Network and Ocean Wise.